It’s impossible to passively observe “12 Years a Slave.” From an opening shot that has a group of slaves looking directly at the audience, the film is engaging and begs for attention and reaction. With this remarkable picture following his “Hunger” and “Shame,” Steve McQueen has established himself as one of the most vital directors working today. And his latest masterwork is absolutely one of the best films of the year. The 1853 memoir of Solomon Northrup is adapted thoughtfully by screenwriter John Ridley, not skimping on the brutal realities, but also pausing to recognize the casual horrors accepted as custom by perpetrators of the slave trade. Paul Giamatti’s trader slaps his specimens as cattle, referring to them as “meat” and “beasts,” opening their mouths so potential buyers can inspect their teeth. The acceptance of deplorable routine is a shock that’s not lost within the flagrant physical and spiritual tortures endured by the wrongfully oppressed. Northrup (Chiwetel Ejiofor) was born a free man, living as a musician in New York with a wife and two children. Fooled, drugged, and kidnaped, he wakes in chains in a dank basement – his freedom instantly gone and a new identity forged by slavers. He’s beaten savagely as initiation into his new life. Soon he’s shepherded by ferry to Louisiana, the water churning behind the ship indicating he’s now part of the machinations of the trade. An efficient Hans Zimmer score with notes of gothic horror strings underlines the helplessness. Sounds and songs are a major factor in building the atmosphere of torment. After being sold to a man named Ford (Benedict Cumberbatch), Northrup and a group of slaves are mocked in a refrain sung by a scornful overseer (Paul Dano, in yet another creep role). His concerning chorus bleeds over on the soundtrack into a church service on Ford’s plantation. The next service is also shown but not heard, scored to the sounds of a slave weeping uncontrollably after being separated from her children. A brilliant skewering revealing the falseness and duplicitous nature of accepted philosophies of the time. A lack or sparse use of sound is also prudent. After Solomon acts out physically against Dano’s character, he’s strung up in a tree. This execution is halted by another overseer who reminds everyone that Mr. Ford is the one who decides how to handle his property. No one bothers to cut him down though, his toes fighting to gain a hold in the muddy ground to prevent him from chocking – his grunts and a dull sloshing the only noises as slaves mill about in the background and an icy southern belle dressed to the nines watches from a columned porch. The scene is held for an agonizing amount of time, leaving it impossible to ignore the dread. 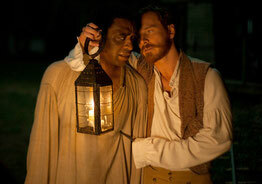 Solomon is moved to another plantation run by the more sadistic Epps (Michael Fassbender), who’s hypocrisy manifests itself as an obsession with his slave Patsey (Lupita Nyong’o – who is amazing in her first feature). McQueen is able to balance the tenuous and volatile relationships of Epps, his wife and Patsey without ever shifting focus away from Solomon. 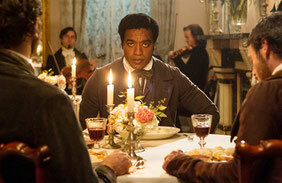 Ejiofor is stellar in the role – passionate while still showing the wares of his unimaginable fate. He has illusions of escape, but every opportunity is met with a blockade – each involving the very real possibility of being murdered. He never completely loses hope; though he destroys the violin he used to make cheery music and, against his nature, joins a group of slaves in singing a melancholy spiritual. At points it’s as if he’s allowing himself to devolve. There’s no rejecting the notion he is now a slave. Superbly acted and expertly directed, “12 Years a Slave” is a history lesson that doesn’t bore with a string of particulars or exhaust with an overbearing cruelty. Though there may be some valid nitpicks – a scene of whipping borders on excessive for the point of being excessive, Brad Pitt’s character is a bit convenient with dialogue that is plot and message-serving – but as a whole "12 Years a Slave" rests firmly in the area of unblinking truth. More so, an important truth in an important film that begs – and needs – to be seen.